Starring Zachary Levi, Mark Strong, Asher Angel, Jack Dylan Grazer, Djimon Hounsou, Grace Fulton, Ian Chen, Jovan Armand, Faithe Herman, Cooper Andrews, Marta Milans, Jovan Armand, Adam Brody, Meagan Good, Ross Butler, D.J. Cotrona, Michelle Borth, Caroline Palmer, Evan Marsh, Carson MacCormac, Ethan Pugiotto, David Kohlsmith and Lotta Losten. Distributed by Warner Bros. 132 minutes. Rated PG-13. DC has been trending back towards the light a bit in recent films. Wonder Woman was great fun, even if still a little bit dark. The Flash added some light comic moments into the otherwise overwrought Justice League. Aquaman, while not a very good film, at least did give its protagonist a sense of humor and a sense of fun, even if the film was not exactly well written. However, it is with Shazam! of all characters, that DC has finally put together a movie that works on pretty much every level, a movie that doesn’t just stand out among DC Films but would also stand tall in the company of the best of the films in the Marvel Cinematic Universe. The original Captain Marvel came out for the long-forgotten Fawcett Comics in 1939. (Kudos for the Shazam! filmmakers for naming the lead character’s high school Fawcett High.) In the 1940s, Captain Marvel sold more copies than even Superman. However, the company hit problems and eventually went under, the character eventually being purchased by Fawcett’s main competition, DC Comics. Billy (the terrific Asher Angel) is a fourteen-year-old orphan, who has broken out of many foster homes in search of his mother, who he lost in a crowd while just a toddler. With only their last name to go on, he searches for as many women named Batson as she can, eventually ending up in a funky-but-loving Philadelphia foster home when his latest attempt to find his mother goes south, like they all do. At first, as is his nature, Billy tries to escape. However, he eventually befriends the comic-book-loving, sarcastic, handicapped housemate Freddy (Jack Dylan Grazer of IT) and kinda gets to like the rest of the people there. However, he still keeps his traveling shoes at the ready. However, when a strange wizard (Djimon Hounsou) gives him superpowers, Billy turns to Freddie for instruction in the superhero life. Shazam! shows a superhero actually in giddy awe of his awesome abilities, rather than the standard DC mode of superpowers being a crushing imposition. Shazam has more of an everyman (or every-boy) reaction to powers. Being a superhero can be fun, and you can meet chicks, and you can make money from it, and you can become a YouTube phenomenon. You can even get beer if you want. Someone happy to become a superhero. What a concept! Also, more than most, Shazam! has a villain worthy of the character, too. Dr. Thaddeus Sivana is basically an overgrown kid as well, a mad, jealous, evil one. The movie actually starts with Sivana’s origin story, in which as a small boy in a car crash, he gets a chance from the same wizard to get the same powers Billy will eventually get. This segment is a bit dark, leading you to worry you’re getting into another DC mope-fest. 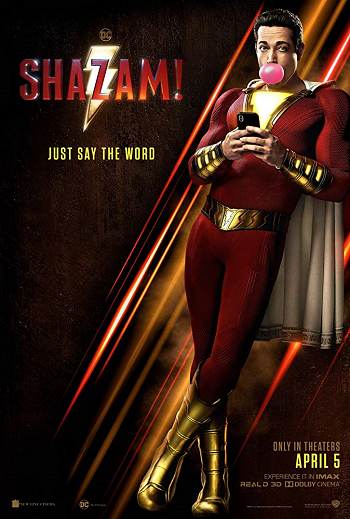 Don’t worry, that is just a fake-out, soon enough Shazam! is fun and funny, and at the same time heartfelt and sometimes a bit scary. I won’t tell you all that much else so as not to spoil surprises, but Shazam! is a smart mixture of humor, drama and action. And it takes place in my hometown of Philadelphia, which is a nice bonus. Not only is Shazam! the best DC film in possibly decades, but it is also by far the better of the two “Captain Marvel” movies of the year. Copyright ©2019 PopEntertainment.com. All rights reserved. Posted: April 5, 2019. Tags: adam brody, Asher Angel, Captain Marvel, Caroline Palmer, Carson MacCormac, christopher nolan, Cooper Andrews, D.J. Cotrona, David F. Sandberg, David Kohlsmith, DC Extended Movie Universe, Djimon Hounsou, Ethan Pugiotto, Evan Marsh, Faithe Herman, Grace Fulton, Henry Gayden, Ian Chen, Jack Dylan Grazer, Jay S. Jacobs, Jovan Armand, Justice League, Lotta Losten, Mark Strong, Marta Milans, Meagan Good, Michelle Borth, movie review, origin story, philadelphia, PopEntertainment.com, Ross Butler, Shazam!, Tim Burton, Zachary Levi, Zack Snyder. Bookmark the permalink. Previous post ← On the Orange Carpet at the 2019 Kids Choice Awards!